The theme for the 52 Ancestors in 52 Weeks challenge this week is Love. This can be interpreted in many ways. My heart belongs to Antonio Medeiros not because I have a weird crush on my ancestor, but because he expanded my tree by many generations. When my arthritis got bad, I had to give up researching at the family history center. 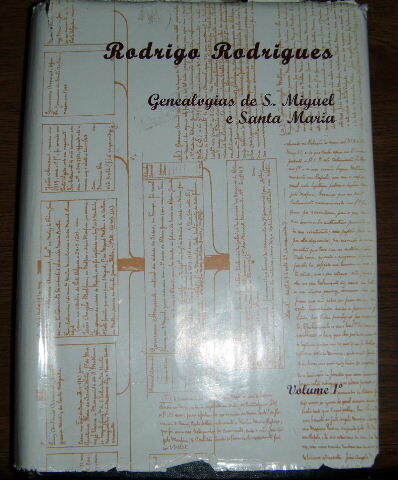 A fellow researcher told me about an important book called “Genealogias de S. Miguel e Santa Maria” by Rodrigo Rodrigues that had recently been published and was available for purchase. I bought a copy hoping that I might find an ancestor within. The book is in Portuguese (naturally) which slow me down a bit. But, I am tenacious and didn’t let a little thing like a language barrier stop me. I began going through the index and comparing names to my pedigree chart. It is alphabetized by first name making it a little difficult to work with. You can imagine the amount of people with first names of Maria, Jose, Francisco, Antonio, Isabella, and so forth. I had an Antonio Medeiros married to a Francisca de Sousa, but my guy was Antonio Medeiros Cordeiro. I made note just in case. Although my ancestor, Anna Pacheco de Medeiros isn’t listed as one of their children, her brother, Manoel de Medeiros Sousa was! I had picked up his daughter, Barbara’s line along the way. So, I was pretty sure this was my family. I was able to follow this line back to the original ancestor, Rui Lopes, who came to Sao Miguel Island sometime in the mid 1400s. I then followed other parts of the tree. I found that I was also a descendant of another founder, Goncalo Vaz Botelho. This book kept me very busy for many months as I followed and recorded each line. Now that the records are online, I am able to search for the original baptismal, marriage, and death records. I can verify the work that Rodrigo Rodrigues did and add to it. It’s no wonder that I have a research crush on Antonio Medeiros Cordeiro. He has produced volumes of research notes and filled in several boxes in my pedigree chart. Also, somewhere along the way I picked up enough Portuguese to read most of the entries without the aid of my dictionary. The picked up ancestors and I learned more of the language. Thank you Antonio! Ran into your article and found it to be fascinating. My father’s surname is Cordeiro da Ponte and his family lived in Lomba da Maia, my mother’s surname is de Couto Medeiros and her family is originally from Ribeira Grande, although my grandfather, Eduino Medeiros, raised his family in Ribeira Funda. I always had an interest in the genealogy of our people but never found a way to research further. Curious if we’re related in any way. Roberto, Thanks for stopping by. I have Cordeiro a couple of times in my tree, but they are early 1800s and 1700s. If you find your ancestors ended up in Maia, there might be a chance that we connect. Did you know that all the parish records for Sao Miguel Island up to 1905 are online to research for free? They can be found at this link: http://www.culturacores.azores.gov.pt/ig/registos/Default.aspx Since you know what villages your ancestors were from, you can begin in the village records.